Brandon Mitson’s competitive baseball career started seven years ago as a Millington All-Star. And as he walked out the hall of Tipton-Rosemark Academy as a graduate, he left an All-Star. In late May, the former Rebel slugger received the news he was a member of the Second Annual State Farm/Shelby County All-Star Game as part of the Private Schools Team. That was a bonus in Mitson’s month as news spread that he was going to sign with Southwest Tennessee Baseball. 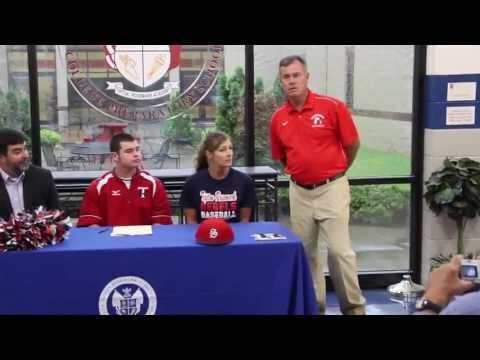 On May 21 in the TRA Lobby Mitson made it official by signing his letter of intent with parents Byron and Marisa present. Also joining the family were TRA Head Coach Brad Smith and Southwest Skipper George Sykes. Mitson used his muscular frame to have a monster senior season with 7 home runs setting a school record. The graduated Rebel also hit .403 with 12 doubles and 42 RBIs. With 31 hits on the season, Mitson had a slugging percentage of .857. Sykes said he is excited to bring a player with potential to hit for power into his program. Sykes also noted Mitson has good speed on the bases and in the outfield. Since he started playing in the recreation leagues in Millington, Mitson has been working to reach the next level. All were on hand for the signing ceremony. Brandon took a moment to reflect on his journey to the college level starting with his father’s support. Taking time with practice at home, Byron invested in his son’s passion for the game with travel baseball in teams like the Millington All-Stars. Byron and Marisa made sure Brandon had the equipment to train and build his body into a prototype slugger. With lessons from hitting coaches like Tim Lloyd, Mitson posted numbers to attract colleges and earn individual honors. “When he swings a bat the ball just does something different when it comes off his bats,” Smith noted. “It just sounds different and carries different. The strength and getting the barrel to the ball, it just sounds different coming off his bat than the normal high school kid. Byron said the past two seasons have been special seeing his son live up to his potential. Byron and Marisa said despite overcoming injuries and illnesses, two consistent things about Brandon has been his work ethic and leadership. Brandon said he remembers being that young ball player looking up to older players. He kept that in mind as he worked hard to reach his goals. One step closer to his ultimate dream, Brandon said he’s proud his hard work was validated with an All-Star selection and college scholarship. But the 18-year-old said it all started with his father believing in him.